Because hundreds of millions of children are suffering on our planet, which is endangered and which is deteriorating more and more every year. Because there is an international treaty signed by all the countries of the world (With the exception of the United States) which could change everything. Because if the UN International Convention on the Rights of the Child was respected, millions upon millions of lives would be saved and our environment would be preserved. Contrary to many of the usual timely interventions which are fighting against one specific abuse or defending one specific right (whether this has to do with the rights of the child or the environment), the CyberDodo Initiative aims to inform, build awareness and educate children and their families on all of their rights and duties. This is to help them to know and understand what these rights and duties are and thus be able to demand that they be respected, with the concrete objective of contributing to the emergence of a worldwide awareness which will result in the long-term improvement of society. To be a universal spokesperson without any pre-conceived ideas of race, nationality, politics, social standing, gender or religion and to spread clear, efficient and understandable information to the whole family. CyberDodo's message of respect and conservation, which is supported by many significant International Organisations, is freely and easily accessible on the Internet. How can I concretely assist CyberDodo? The development of the Initiative (sites, cartoons, the Edupack, case files, games, quizzes, e-cards, bonuses, etc.) has required, requires and shall continue to require significant long-term investment. You can contribute in a significant manner by making a donation on-line (of the amount of your choice). 100% of this donation will be used to help more and more people have access to content of high quality, in constant development and in as many languages as possible. 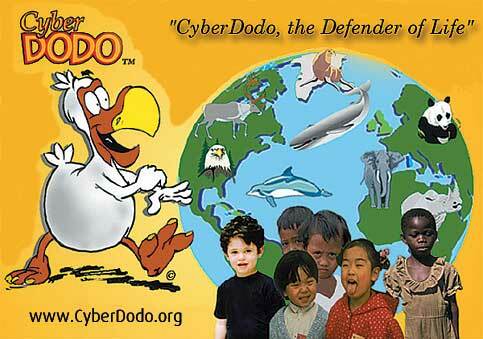 Thank you and well done for providing your support to the CyberDodo Global non-profit association.